In May 2018 I visited Sicily. I flew into Catania. I had booked a B&B near Catania for 4 nights. Sicily is small enough to visit all interesting parts of the island on day trips. After arrival, I drove into Catania for a city tour. There are several interesting places to see in Catania, including the Graeco-Roman Theatre and the Piazza del Duomo with the Elephant Fountain. The first day trip was to visit Mount Etna. There is a funicular that goes up the mountain. The top was quite cold, with snow and ice on the ground. Mount Etna is a UNESCO World Heritage Site. The next day trip was to the Villa Romana del Casale in the center of Sicily. This is a Roman villa with the most amazing floor mosaics that I have ever seen. This is a must-see if you ever visit Sicily. Villa Romana del Casale is a UNESCO World Heritage Site. 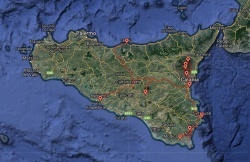 The next trip was to the south of Sicily. I visited Noto and Ispica. Noto has a beautiful street, the Corso Vittorio Emanuele, with many beautiful baroque buildings. 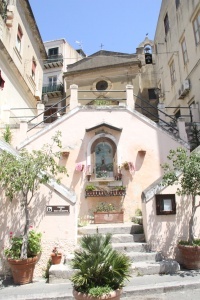 Noto is part of the UNESCO World Heritage Site Late Baroque Towns of the Val di Noto. In Ispica I visited the cemetery, which has some grandiouse tombs. The next trip was to the Valle dei Templi (Valley of the Temples) in the southwest of Sicily near Agrigento. This is an amazing collection of 5th to 6th century BCE Greek temples. The Archaeological Area of Agrigento is a UNESCO World Heritage Site. On the last day I visited Cefalù on the north shore if Sicily. The Cathedral is impressive to see. The Cathedral Church of Cefalù is part of a UNESCO World Heritage Site. Traffic in Sicily is not quite as civilized as on mainland Italy. Many cars drive at excessive speeds, and risky passing happens frequently. Food and drink is good, but fairly expensive. I have put the pictures in individual pages for the various sites that I visited.